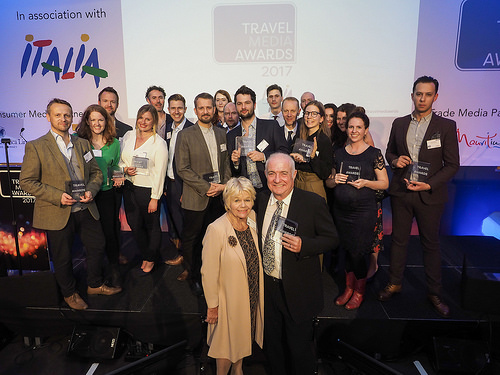 Winners at the Travel Media Awards 2017. Two old friends of Car Free Walks enjoyed a great night last week, when Geoff Allan and Terry Abraham both won prizes in their categories at the Travel Media Awards 2017 for their latest works on the Great Outdoors. Geoff's excellent new book 'The Scottish Bothy Bible' won 'Guide of the Year', while Terry's latest film from the Lake District – 'Life of a Mountain – A Year on Blencathra' – won 'Broadcast of the Year'. You can read more about the winners here. Both are keen car-free walking (and cycling!) enthusiasts and have supported our site over the years. You can read Geoff's post about one of his favourite bothies in Scotland on our blog, and win the prize-winning book in our latest prize draw. And Terry has also very generously provided us with prizes in the past. We wish you both every success in your next ventures and, as always, happy walking!